Oh how I remember your words and teachings standing in front of the “Princess” at the MET. Thanks Marvin. I am currently adapting elements of your color theory/mixing methods for use with my high school painting class. I appreciate your lessons. I’d like to suggest an alternative culprit — the photograph. This is a stunningly beautiful woman — and the reference photo does not convey this at all. This is fundamentally a lesson in the problems associated with working from photos — the quality of the finished work is limited by the quality of the reference photo. I agre that Kate is truly stunning and tto that end she was not well served. She chose the artist — hoisted with her own petard. When I stated that the placement of the head and the lighting were not optimal, I was referring to the photo reference. It was late and I should have clarified that. So I agree with you it was a huge contributing factor. However I don’t blame the fact he used photos. If his intention was to convey illusionistic reality the photos he used were poorly chosen but I don’t think that was his intention. When I you look at Mr. Emsley’s work his it’s clear to me that intent lies elsewhere and he regularly uses source material that I certainly wouldn’t use for my purposes. There is only one problem associated with working from photographs and that is a lack of thorough understanding of the process. THe acronym GIGO — garbage in/garbage out — sums it up perfectly. But a lack of understanding in any aspect of making paintings can be problematic. Thanks for sharing. This is why, I put my camera on rapid-burst, and then chose the most appealing and clear shot of the performer I’m intending to paint…one photo NEVER does the trick! Don’t judge photography based on lack of understanding. It too requires great skill. photography skill comes from ‘working with what you got’ and with a sony cybershot, I get what I can get, in poor lighting (open mic nights never have great lighting! ), and fast-moving guitar hands! I’ve come across far too many people with expensive cameras, believing that simply because they bought a high-end camera, their photograph quality would improve – simply not true. Emily, I agree totally that an expensive camera does not a great photographer make. However when I talk about being a skilled photographer I’m talking about maximizing the information for use as source material for painting. A great photo doesn’t necessarily translate into a great reference photo. In fact it usually doesn’t. When I take a reference photo I want to replicate, as close as possible, the way my eye sees. Clarity, color fidelity and wide dynamic range are of utmost importance. Fortunately todays digital cameras have risen the bar exponentially in that regard, and there seems to be no end in sight. The technology keeps improving at break neck speed. Unfortunately the more expensive cameras and lenses are technologically superior in that respect. By the way, I corrected your previous post! Thanks for this essay Marvin, nice to read a well thought out critique. This is a wonderfully worded critique. Thank you so much for posting this! I will be sharing this with my non-artist friends, many of which have asked me how I feel about the royal portrait. Your essay is excellently written, objective, and fair. Thank you! Mr. Mattelson, Thank yo for helping me understand “elements” that could have made Mr. Emsley’s work stronger. I have not done ANY portraiture, but belong to a group that is helping others learn all types of oil painting. I am passing your blog along – as you say “Forewarned is, after all, forearmed!”. Doing it is another thing… Thank you. Thanks for your comments. The best way to learn is to take a class or workshop with me. 😉 I can save people years of spinning their wheels. Yes Jason I agree that would be great for everyone but me and my mortgage carrier. 😉 I’m definitely looking for ways to get the word out there at a reasonable cost to anyone interested, but between teaching and my commissions my time is very limited. For those not willing to wait a class or a workshop with me can be career altering. Really awesome post Marvin! You know, you could sit down with someone, and get repros of the met images, and make an app-book of your full day met tour. Sell it for an affordable price, and make some extra dough! PS Id be happy to help with this. Thanks Brandon. The problem is the copyright. I would have to negotiate with the met and I don’t think it would be cheap. Now if you wanted to procure legal rights to publish the images I think we’d be in business. He only provides the entire lesson in class – but since moving to Canada isn’t really an option (or New York in this case), you should consider having your workshops video recorded, and then set up a time scheduled slot online, that will stream/broadcast your lecture/lesson, and people have to pay a membership to view these lessons. This was really interesting and it struck my mind as a detailed and expert analysis of Portrait Painting. I have to admit my mind tends to glaze over when it’s being called to attend to the fine points or little touches and nuances that make the difference between an adequate work and one of excellent or above excellent quality. I am more likely to grasp the most striking features of a work and its biggest themes and the general sweep of its impact upon me. There is nothing wrong with this portrait of Kate Middleton to me. The thing that strikes me is that the color palette is more muted and therefore the colors are not as sharp as in the photo reference. I would have made the colors even sharper in the painting than in the reference. I am also a fan for seeing more of the modeling of the planes of the face and the body, I suppose this is the sculptor in me talking. But I think the above statement underlines the point I am making. People bring their own particular point of view and aesthetic sensibility to what they are viewing or experiencing as Art. There are people for whom the more muted palette and softer modeling of the planes of the face is totally agreeable and more a suggestion of Kate Middleton being rendered in paint for the regard of posterity. Lastly, I hope this isn’t the one and only sitting of artist and model. He should do several more portraits of Kate Middleton. Sooner or later, he’ll do one that everybody will agree is a home run! Thanks for your input. Yes in the end it all comes down to taste. But the overwhelming negative spin is an indicator that something went very wrong. Personally I think the color isn’t a strong point here. I’ve heard that the color in the original is more akin to the photo, but that’s heresay from an unreliable source. I don’t think this artist will get another shot. Traditionally members of the royal family are painted by many different artists. I think the only way someone gets another shot is if they knock one out of the park. Anthony Van Dyke comes to mind. Thank you for this very thoughtful article. Every painting speaks volumes about the painter. To a seasoned eye, this one suggests a lack of authority painting from life, resulting in a lifeless, flat portrait which lacks any sort of ‘artistic presence’ one finds in the works of excellent artist/portrait painters. Great portrait artists surely those whose technique and skill are so superb, that they able to capture the spirit and essence of the subject, in spite of the likeness; Artists such as Sargent, the Russian/American painter Nicholai Fechin, and yes, Lucian Freud. Primarily painters from life, even if these artists used photography, their authority with the primary medium, light, is apparent in their remarkable work. With such skills, finely tuned, they are able respond to the subject’s personality, bringing more than just a ‘surface interpretation’ to their work. Marvin, you have written a very interesting article, and one which brings up a topic of baffling complexity. How far should an artist imitate the camera? Vermeer clearly imitated the camera very closely. He recorded highlights as circular blobs, which is how they look on the plate of a camera obscura, but not in life. He also simplified tonal areas in the way that a camera might suggest. In Vermeer a tonal area is rarely a plane, as it is in other Dutch painters, such as de Hooch. His tonal areas are not planes which explain the form: they exhibit the kind of flattening such as the ‘posterize’ filter in Photoshop might produce today. So it seems that imitating a camera, and “winding up with a flat photographic look” (or at least the look of a 17thC camera obscura), can sometimes result in some masterpieces which astonish the world. As you suggest, it is unwise for any of us to criticise a fellow painter for having made his own choices in such a complicated field. Gareth, you bring up some interesting points. I think a quick response on my part won’t begin to do this sticky topic justice. I plan in addressing these very issues in a future blog post. Marvin, I truly enjoyed how you addressed the finer points of portraiture in your experience as they relate to the royal portrait. When I first read of the public reaction to the portrait I was curious why people were so critical. The worst news to me was the artist doubting his own work. I hope he can brush off the criticism and continue his interesting style. It’s terrible that he was made the scapegoat. As artists our egos are fragile, because we put our heart and soul into everything we do. They say there is no such thing as bad publicity. I hope for his sake they’re right. Thank you for spending the time it must have taken to write such an in depth critique on the portrait of Kate Middelton. I think I have taken over an hour to read and keep looking between the photo and painting. Much of what I felt was “off” in the painting was so well explained in terms I am slowly learning to grasp in my own education; edges, planes, contrast, over modeling/over softening and then the all important understanding of common problems with reference photography, the good and the bad of a tool we portrait artists must depend on more and more. I would also like to compliment you on your diplomacy in this dissertation. Your respect for Paul Emsley reflects your respect for all serious artists. I appreciate it in this world where others so easily sling the mud. Thanks Patty, I’m looking forward to it. I suppose Critic Michael Flood McNulty never saw freud’s portrait of the queen? 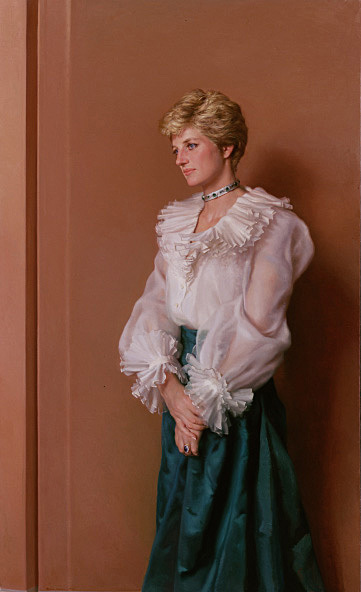 http://www.jssgallery.org/Other_Artists/Nelson_Shanks/Princess_Diana.jpg and knowing that she actually had to sit and pose for him. Why they would have done a official portrait from such a bad single piece of photo reference. My first reaction when I saw the Kate Middleton portrait was that it was painted from a photo. And there it is, Why would you use THAT photo for such a important painting? I mean she is the Duchess of Cambridge, and the (possible) future Queen of England. and you don’t think of getting the best reference you can if not actually have her sit and do some paintings from life? This could be the most important painting this artist is ever asked to paint as far a publicity stand point. You know the say about opportunity presented to the unprepared. too bad really In fairness I have seen a lot worse paintings but I think the artist really held him self back with the reference. I think he went about it in his usual manor. After all what he’s done in the past is what got him the commission in the first place. I don’t think anyone ever anticipated the level of fallout. For me personally I treat every commission as it has the possibility to alter my career. I had the same mindset when I worked as an illustrator. Once I was commissioned to create album cover art for a CD of Gregorian chants. I figured it’s probably going straight to the bargain bin at Tower Records and no one would ever see it, but based on my above stated philosophy I did the most beautiful painting I was capable of. Well the album was called Chant and it sold over 12 million copies and became one of the most successful classical albums of all time. Every moment of every day is a great opportunity. First, he should have used a much better photograph. In formal portraiture one strives for likeness, but an ARTIST should paint personality, life, excitement (with such a subject) and none is apparent. There is no strength in her face, no life in her eyes, and that great smile is a “so you’re a great artist,huh?” look. I’d say scrap it and start again.!!!!! Kate will have scores of portraits painted of her, especially if she becomes queen one day. Some will be awful and hopefully a couple will do her great justice. Queen EliAbeth was painted by a wide range of artists, from Annigoni to Freud. I guess they figure if you keep shooting a shotgun into the air you’ll eventually hit a duck. No, the middle initial is just as Scottish (Cameron) but I may have had some connection to the GLASS PALACE Paxton. I have done portraits myself and I have seen some great ones. Robert Griffing does the Indians of Pennsylvania that take my breath away. I had a friend with a house full of portraits of every notable artist she could find. I think she was shot gunning. Some were notable!!! In the end I guess it all comes down to personal taste. Marvin this is an excellent post. Thank you for taking the time to point exactly what went wrong. I’m saving this post in my drawing reference folder. I’ve never read an artist who can so skillfully deconstruct a painting. You really need to publish a book already! Hi Marvin, an excellent and even-handed analysis, and a breath of fresh air after all the mean-spirited attacks. Why would anyone do a portrait of someone who is living using only bad photos? No one here has mentioned working from life, the single best way for an artist to see. Not to interpret what the camara sees. Use of photography for the artist should be a tool not a crutch. It is not ideal to have to guess at what colors are in the shadows or the exact color of her eyes if you are staring right into them. Even the busiest people will find time for a portrait artist to sit. Oh how interesting it is to speak with your model, especially this one. Make a connection with the model, bring that to the painting, it all comes through in the finished work. Even if a full portrait is not completed from sittings a wealth of information can be gained from an oil study and color notes and then interpreting a photo and its shortcomings is so much easier. Where I disagree is in your assumption that even the busiest people will find time to sit. That, in my experience, is absolutely not the case. Some people get antsy even after 20 minutes of posing for reference photos. Certain A type personalities literally can’t sit still. The higher the fees you charge for your portraits the more likely you are to run into this kind of thing. Generally the people who can afford to pay top fees are less likely to be able to afford the time. I don’t want to beat a dead horse here (well maybe a little) but Kate chose this artist knowing the way he worked and she professed the painting to be “Brilliant!” It’s merely conjecture on my part, but maybe the fact he worked primarily from photos was a big part of her reason for choosing him. She has a very demanding schedule and may not have wanted to sacrifice what little down time she has. The bottom line is that the artist and client were both initially pleased with the result and it was only in the court of public opinion where expectations were not met. So what is the bottom line? Will the picture be used as the official portrait or just hung up in their many personal rooms in the castle? Im not sure what the final destination. All the royals have a multitude of portraits done during their lifetime. They’re all considered official. I have just read your comment about focusing on the eyes and letting form/planes in front and beyond go out of focus – to varying degrees since some planes have no sharp edges to exhibit sharpness. I have always taught students in three Universities teaching Painting, Drawing and Printmaking and painting professionally for 55 years, that I distinguished between what seems to be called “realism” as artist who paint almost everything in the same, sharp focus and “naturalism” where this was/is not how human eyes (binocular) see. I have always felt we do sometimes “scan” but when attempting to focus we see what we are searching for and that area is in sharpest focus and everything else in in soft focus with mental awareness of the peripheral focus. We all can test this individually. I do not know how much individual variance there is or how much subjective difference there is in articulating ones perception. The easiest example of this difference can be seen in the painting of trees in a “realist” landscape where the artist has painted individual leaves and the naturalism of painters all the way from Cezanne who paints planes in space and never (?) individual leaves to Old Masters of the tradition of Titian where much atmospheric perspective is used. The issue of stylistic as in Botticelli come to mind but this is outside the realism/naturalism ways of painting but not seeing. I say it is a choice but verbal expression of this may be a subjective matter of visual perception. Thanks for sharing that Ron. It’s oft been said, “Variety is the spice of life!” I think that applies to all aspects of painting, and certainly edges. Two of my favorite artists, Paxton & Bouguereau, were masters of edge handling. Thank you for the comment. Teaching is half of what I love to do.